The film tells us nothing of Rufio’s origin and how he came to be in Neverland. But imagine the state of Neverland when Pan decides to elope with his girlfriend’s (Wendy’s) granddaughter back on Earth and leave Neverland and all its inhabitants behind. Who kept Captain Hook in check all those years? Who kept the lost boys safe? Who upheld the alliance between the Natives and the Lost Boys? … it was Pan. Without him Neverland fell into chaos. The Lost Boys were truly lost, without a leader they stood no chance against the insatiable Hook, who, without a “worthy opponent” easily killed or captured all those pesky Lost boys who foiled him and his dread crew all those years. The Lost Boys found themselves enslaved amongst Hook’s crew, forced to toil under his command. Distraught by the plight of those she loves, Tinkerbell returns to London to try and find Peter. But it’s the early 80’s, and he was adopted many years ago by the American “Banning" family and lives across the Atlantic. Pressed for time, Tink searches locally for a suitable replacement. She hears shouting from around the corner and flutters over to see what the commotion is about. "I don't care what you say, old man!" a leather-clad young man with a fierce mohawk shouts, "You're not my dad, you're nothing! I'm going and you can't stop me!" He slams the door loudly and ignores the neighbors' concerted gazes as he slips into a dark alleyway. Intrigued by his fearsome appearance and attitude, Tink follows the young man covertly to a rundown warehouse where a gang of similarly-dressed miscreants greet him eagerly and slip inside. A cacophony of sound fills the dilapidated warehouse and the inhabitants are whipped into a frenzy by the chaotic music being played. Tink was entranced, it reminded her of the natives back in Neverland with their raucous ceremonial rites. Amidst the chaos, the young man slowly approached the stage where the music was being played. The turmoil of the frenzied mob turned to a well-rehearsed chant, "RU-FI-O, RU-FI-O, RU-FI-OOOOO!" the crowd shouted with a primeval rhythm. When the young man took the mic, he let out a ferocious, ear-piercing scream and the band began a war-like gallop behind his skillful lead. Tink was entranced. The whole congregation moved in unison to Rufio's music, and they hung on his every word. Tink knew she had found a suitable candidate to lead the lost boys. It takes some convincing from Tink, but Rufio finds that Neverland suits him… never-ending youth, makeshift living spaces, oppressive Pirate warlords to defeat; what more could a young punk want? Tinkerbell takes Rufio to see the Natives where he learns combat, swordplay, and most importantly how to properly form a triple mohawk. Armed with his new skills, he is ready to infiltrate the pirate ranks and liberate the Lost Boys. Rufio approaches the pirate encampment much to the delight of some drunken sailors itching for a fight, he easily bests them in hand to hand combat, and Hook (watching from afar) is impressed by his swiftness and ferocity. He decides Rufio will make a useful addition to his crew and invites him onboard. Hook gives Rufio the grand tour, bragging about his victories and exploits, especially his prisoners; who he can’t wait to show off to Rufio. Below deck, Rufio is shocked at the harrowing scene of boys much younger than himself cleaning the ship, heaving and hoeing, and living in squalor. It only makes him more steadfast in his resolve to free them. As the days go by, Rufio and Tink carefully inform the Lost Boys of their plan to rise up against their pirate oppressors. Emaciated and broken, the young, frightened boys are hard to convince. Most would rather stay and be safe than risk death or torture, but Rufio’s vigor becomes contagious amongst the boys. One by one, they are convinced they must rebel. It is dawn, and Rufio has convinced the captain that the Lost Boys would be very good at collecting fairy dust on another part of the island. Excited by this idea, as fairy dust is what keeps Neverland young, Hook agrees and lets Rufio lead a small outfit of pirates and the Lost Boys on an excursion into the jungle. As soon as they reach the shore; Rufio stabs one of the pirates and the boys rise up against the rest of the crew, much to his delight, none of the lost boys were killed, and he leads them safely into the trees. Utterly distraught, Rufio vows never to put the Lost Boys in harm’s way again. Deep in the forest, Rufio and the boys build a new life hidden from Hook and the pirates. Ten years later, with no one to fight and tortured by boredom, Hook returns to the world to coax his long-lost nemesis Pan back to Neverland by kidnapping his children. When Tinkerbell informs Rufio that Hook has captured more children and he must free them, Rufio refuses to risk the lives of the boys he saved by going to war with the pirates. Unable to convince him, Tink returns to the world to bring Peter back. He has completely forgotten Neverland and who he was; he is as useless as he is old, but despite even his own disbelief in himself, he is insistent that he must get his children back and that the Lost Boys should help him. Rufio is not happy about the arrival of this old, fat oaf claiming to be Peter Pan, demanding he send his young Lost Boys into a deadly battle with seasoned pirates to retrieve the children Pan himself could have saved with a simple act of courage. Rufio does not share the Lost Boys’ memories of Peter, and so must remind them that he is the one who saved them from Hook, and Pan is the one who left them to die. Besides, Peter Banning is not the flying, fighting, warrior Rufio has heard so much about. Despite this, a few of the Lost Boys believe in the middle-aged Pan and take it upon themselves to train him. Still skeptical and protective of his Lost Boys, Rufio confronts Pan at dinner and attempts to expose his fraudulence. His plan backfires when Peter begins to use his imagination at the food fight, but Rufio decides to give him one more test and hurls a coconut at Pan who slices it in half with expert swordsmanship. Upset and confused, Rufio withdraws while more and more Lost Boys begin to place their faith in Pan. As Pan grows stronger, Tinkerbell councils Rufio; telling him that if he continues to reject Pan, he will lose the Lost Boys. Rufio’s dilemma is wholly realized at this point; even if Peter is not the Pan, shouldn’t the Lost Boys save those children from the same fate they suffered for decades? When Rufio hears Pan’s wretched crow and sees him soaring through the air; all doubt is washed away. He is the Pan, and Rufio will fight by his side, honored to crow with the legendary nemesis of Hook in one final battle. 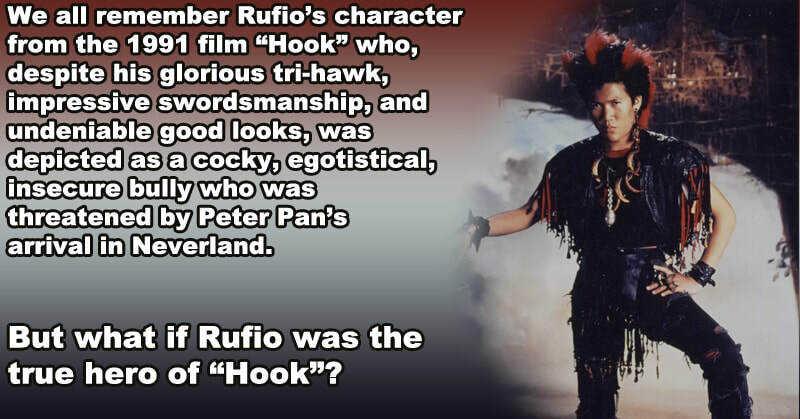 Rufio also aims to seize this opportunity to take revenge on Hook for murdering that young lost boy ten years earlier.